If you’ve ever attended a Pacific Conservatory Theatre (PCPA) production in the company’s Severson Theatre, then you are probably familiar with the uniquely intimate and cerebral feeling that the square room can impart. PCPA has produced plays like Shakespeare’s The Tempest in the Severson, which gave the play’s deserted island ethos a boost. More recently, Tennessee Williams’ Glass Menagerie was aided well by the theater’s close configuration—you were right there with the characters in their small, humble apartment. Now, to close out PCPA’s 53rd season, two plays will occupy the Severson Theatre in rotating repertory. Both plays include a cast of only two actors. Gidion’s Knot and Trying will show “in-the-round,” explained PCPA resident artist and Gidion’s Knot director Andrew Philpot. Theater-in-the-round is when the audience surrounds a performance, from all sides. Gidion’s Knot tells the story of a mother (Elizabeth Stuart) and teacher (Polly Firestone Walker) meeting about the actions of the mother’s son. The play is full of argument and emotion, Philpot explained, which makes presenting it in the Severson Theatre particularly powerful. 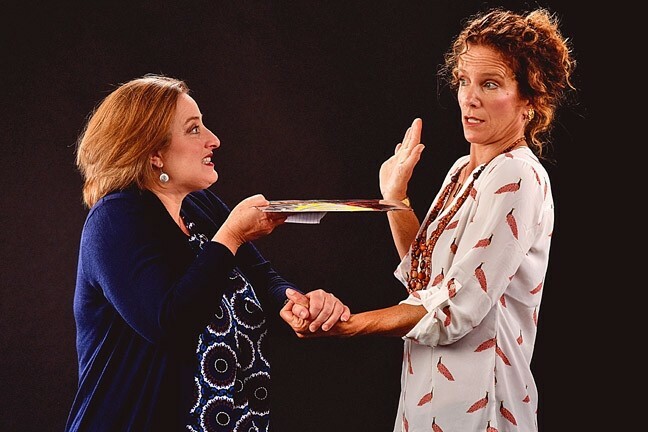 Gidion’s Knot is playing in repertory with Trying, which means that every night after each performance of one show, the entire set is broken down and the other show’s set is prepared, explained PCPA resident artist Kitty Balay. Balay enjoys her directorial debut at PCPA with the production of Trying. The play focuses on the relationship between an elderly judge and his young secretary. Set in the mid 1960s, it’s about the real-life Judge Francis Biddle, who was Harry Truman’s Attorney General and the American judge for the Nuremberg Trials, Balay explained. Biddle (Peter S. Hadres) needs help squaring away a lifetime of keepsakes and paperwork in his home office, and Sarah Schorr (Karin Hendricks) helps him do it. SEE IT IN THE SEVERSON: The Pacific Conservatory Theatre (PCPA) presents the plays Trying and Gideon’s Knot playing in rotating repertory through Sept. 25 in the Severson Theatre at Allan Hancock College, 800 S. College, Santa Maria. More info: pcpa.org or 922-8313. Over months of work, the two—separated by decades of age and cultural progress—learn from each other, gaining a perspective on their own lives from each other’s. They do this all in the cluttered office crowded by a career’s worth of stuff. That means props, Balay explained, and lots of them, all of which are moved after each performance to make room for Gidion’s Knot. The personal nature of both Trying and Gidion’s Knot is aided by the up-close Severson Theatre, Balay said. It gives audiences the opportunity to view what PCPA’s actors do best, which is deliver a dynamic live performance, whether it’s a cast of 20 or a cast of two. Sun Arts Editor Joe Payne from New Times’ sister paper doesn’t mind being boxed in sometimes. Contact him at jpayne@santamariasun.com.